“We just kind of feel like our rights are being infringed upon,” says a woman who toted her shotgun into the store. More images have surfaced of gun rights activists carrying weapons inside Target stores in Texas. On May 31, several women went shopping at a Target in Corpus Christi, toting not just kids but also shotguns and semi-automatic rifles. “We just kind of feel like our rights are being infringed upon, which is against the constitution,” the organizer, Sarah Head, told a local TV station two days before the demonstration. For several months members of the group Open Carry Texas—mostly men, some of whom have used disturbing intimidation tactics against women—have shown up armed at Target stores to demonstrate their right to carry rifles openly in public and to call for the right to do so with handguns (which is not legal in Texas). They’ve hung out in the Target parking lot. They’ve carried their weapons in Target’s toy aisles and declared that the company is “very 2A friendly.” In at least one case, as I reported recently, Target has known in advance that they were coming. In response, the group Moms Demand Action for Gun Sense in America has gone after Target with a social-media campaign, petitions, and demonstrations, pressuring the company to reject firearms in its stores, as a handful of national restaurant chains have done in recent months after open-carry demonstrations. With the backlash over its provocative tactics, including an extraordinary rebuke from the National Rifle Association (which quickly ran away from its criticism when the gun activists became enraged), Open Carry Texas announced back in mid May that it was changing its approach and would no longer carry guns inside corporate businesses where they are unwanted. But apparently its supporters in Corpus Christi didn’t get the memo. 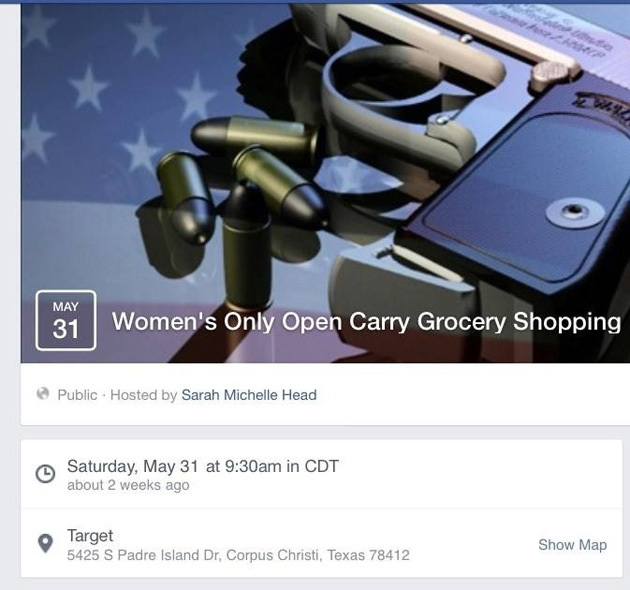 Moms Demand Action began highlighting the images from the Corpus Christi store on social media on Thursday, again urging Target to take action. The company has acknowledged criticisms about the demonstrations, but to date has only said that it complies with all applicable laws; a spokesperson confirmed to me last weekend that the company has no policy specifically regarding firearms in its stores, and declined to say whether the company was considering one. But there are indications that Target may now be doing so. On Thursday, Christopher Gavigan, the CEO of The Honest Company, which just began selling its line of eco-friendly family products in Target stores, tweeted “we are very much in an active dialogue to find a solution” on the issue. @shannonrwatts @Nikluk @jessicaalba @Target In fact, we are very much in a active dialogue to find a solution – more soon! A manager at the Target store in Corpus Christi (who declined to give her full name) confirmed to me by phone that the open-carry demonstrators had been there, and said that they would no longer be welcome with their guns. “From this point forward we’re not going to allow anyone to carry a firearm in our store,” the manager said, though she declined to comment on how that policy might be enforced.